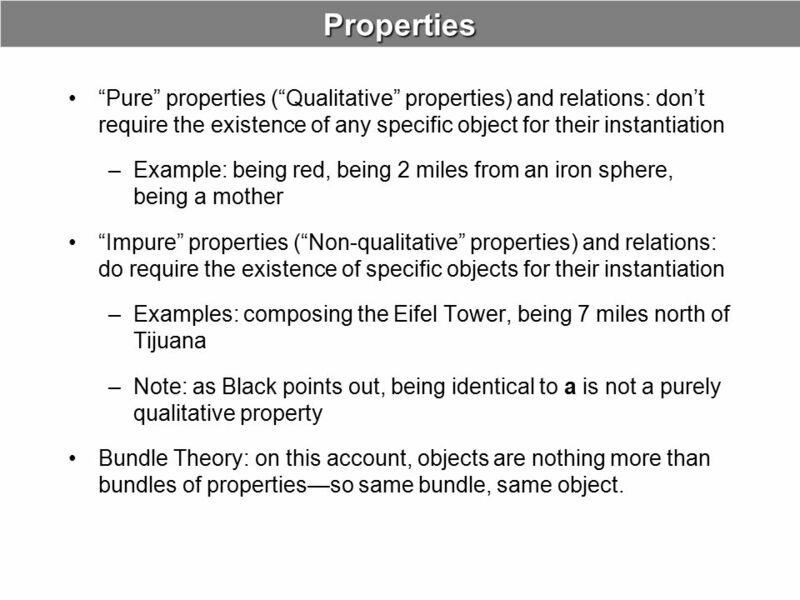 5 Properties “Pure” properties (“Qualitative” properties) and relations: don’t require the existence of any specific object for their instantiation Example: being red, being 2 miles from an iron sphere, being a mother “Impure” properties (“Non-qualitative” properties) and relations: do require the existence of specific objects for their instantiation Examples: composing the Eifel Tower, being 7 miles north of Tijuana Note: as Black points out, being identical to a is not a purely qualitative property Bundle Theory: on this account, objects are nothing more than bundles of properties—so same bundle, same object. 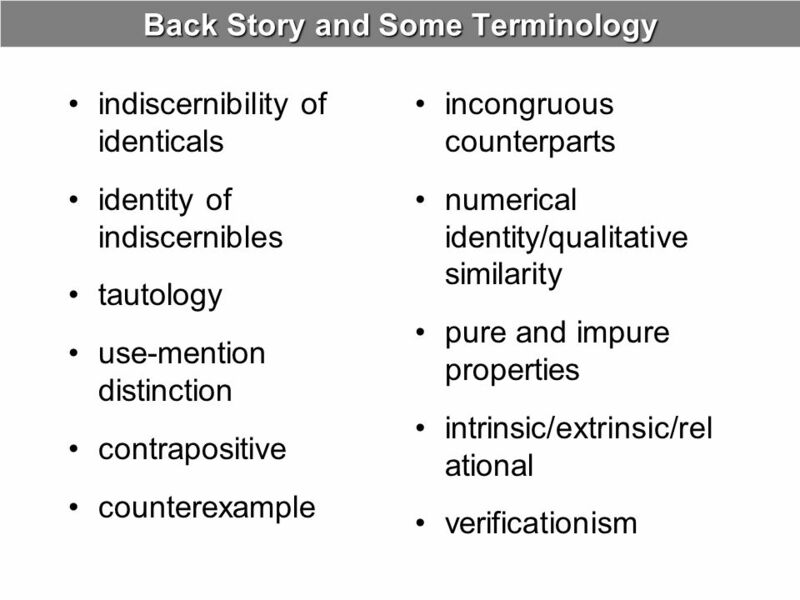 Distinction between the use of a world to talk about something else and talk about the word itself, that is, mentioning the world rather than using it to do its usual job. 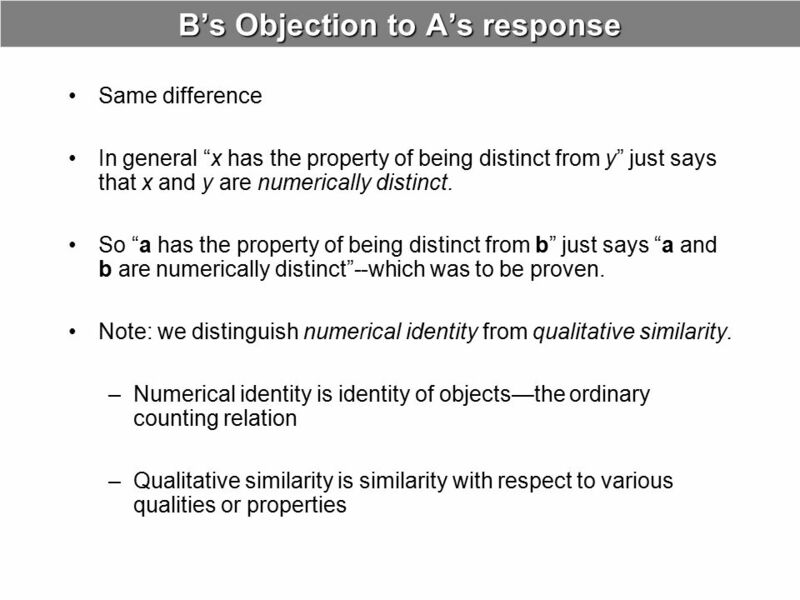 Compare: a = b where “a” and “b” are used to refer to an object with “a” and “b” are names of the same object. 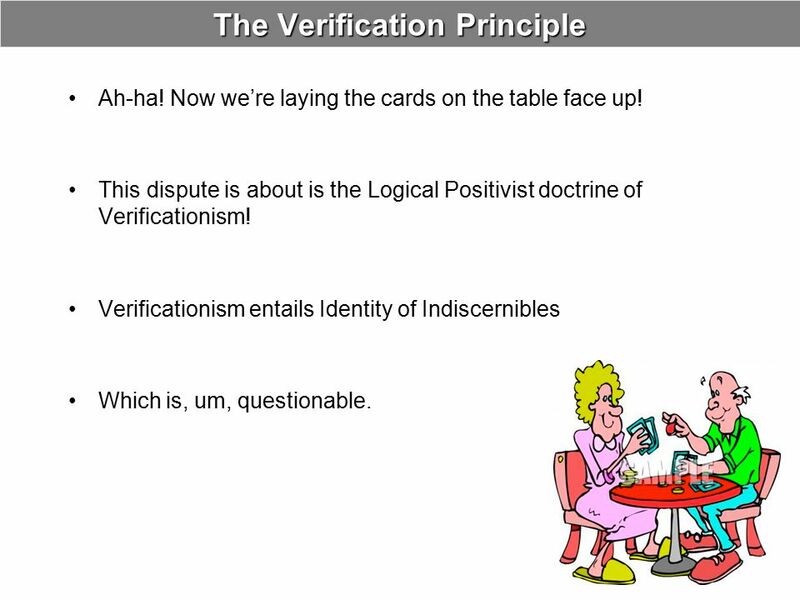 Verificationism Doctrine espoused by the Logical Positivists according to which a factual statement (one that isn’t a mere tautology) has meaning only if it is verifiable in experience. 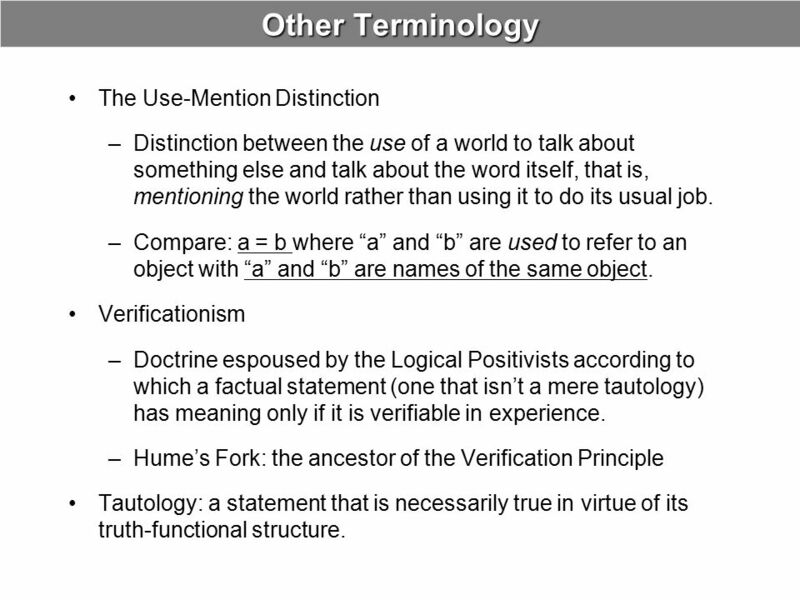 Hume’s Fork: the ancestor of the Verification Principle Tautology: a statement that is necessarily true in virtue of its truth-functional structure. 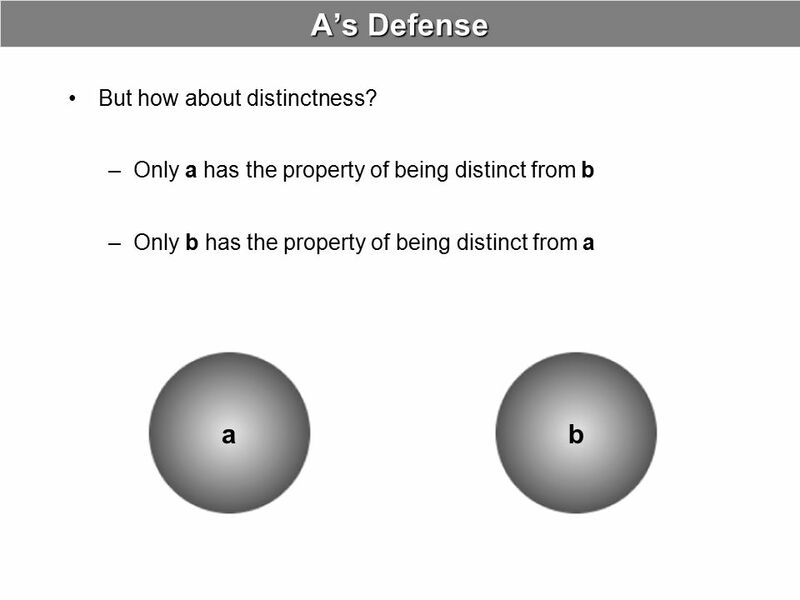 11 A’s Defense a b But how about distinctness? 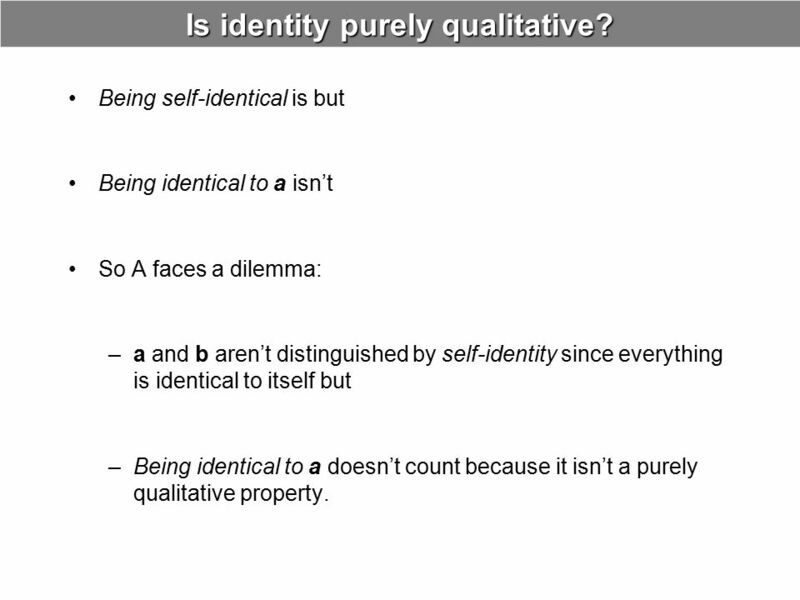 14 Is identity purely qualitative? 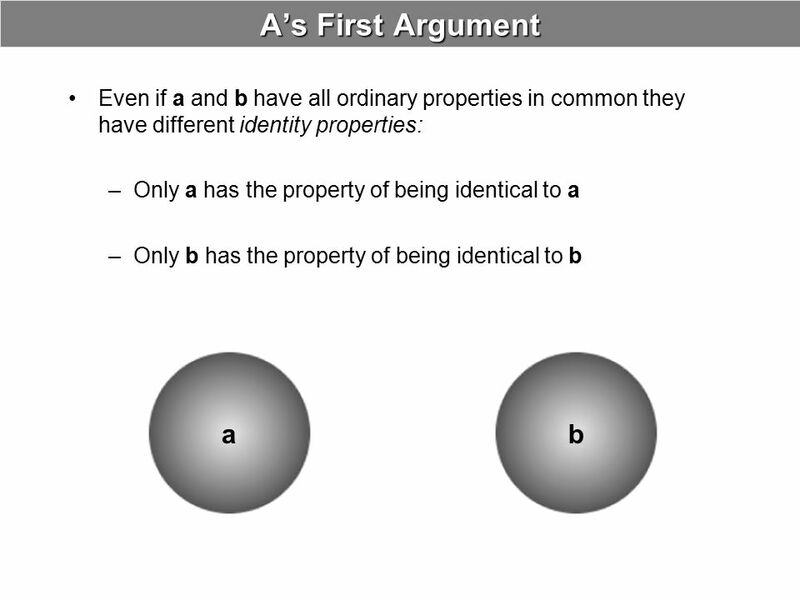 Being self-identical is but Being identical to a isn’t So A faces a dilemma: a and b aren’t distinguished by self-identity since everything is identical to itself but Being identical to a doesn’t count because it isn’t a purely qualitative property. Ah-ha! Now we’re laying the cards on the table face up! 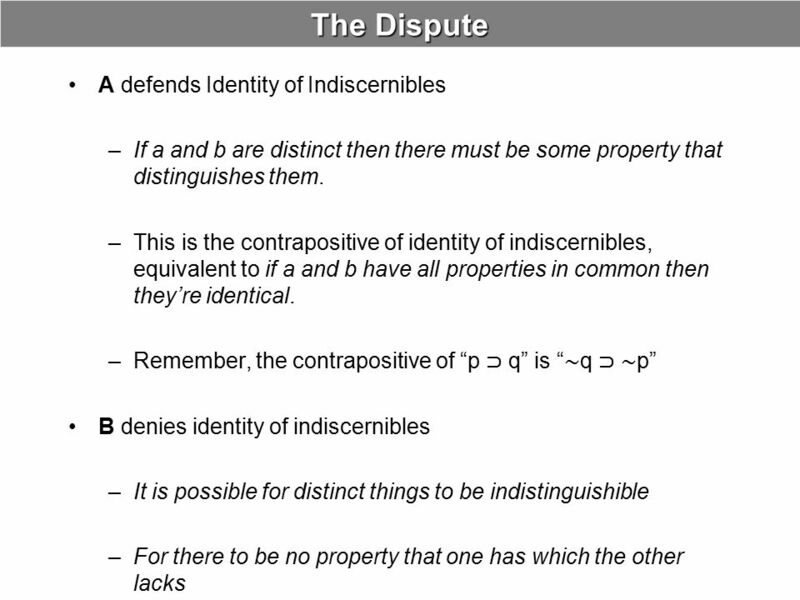 This dispute is about is the Logical Positivist doctrine of Verificationism! 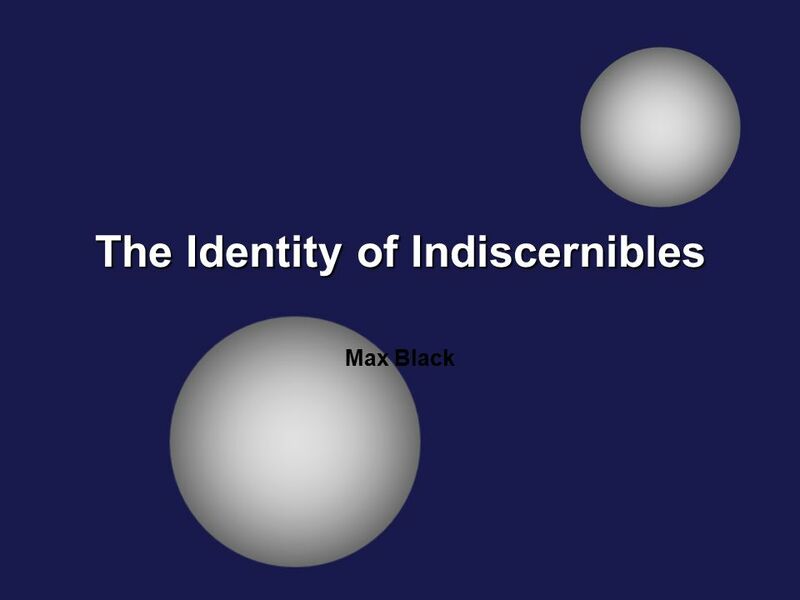 Verificationism entails Identity of Indiscernibles Which is, um, questionable. 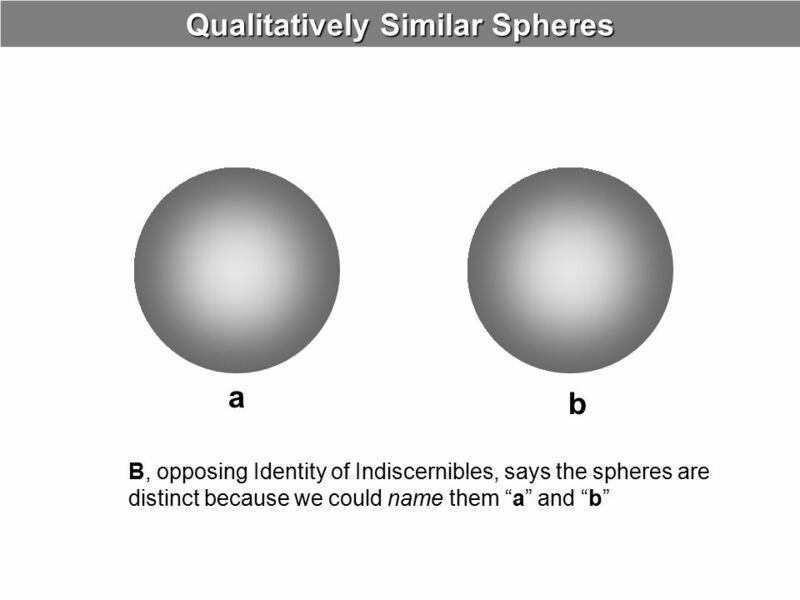 19 A proposes a dilemma When we talk about “naming” the spheres we are, in effect, introducing something else into the picture, viz. 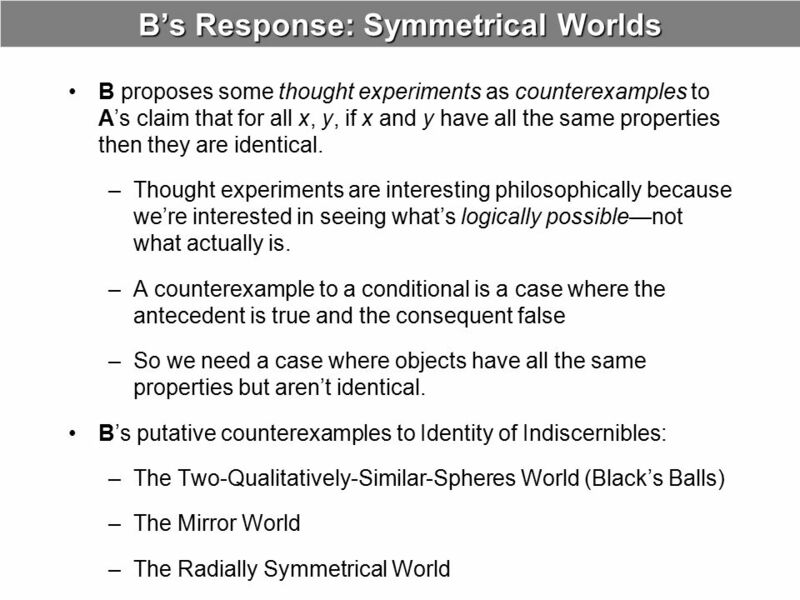 ourselves as namers and this corrupts the thought experiment: If “we” name them we’re introducing a third item (ourselves) into the thought experiment, so a and b are distinguished by a relational property, viz. being named by us. 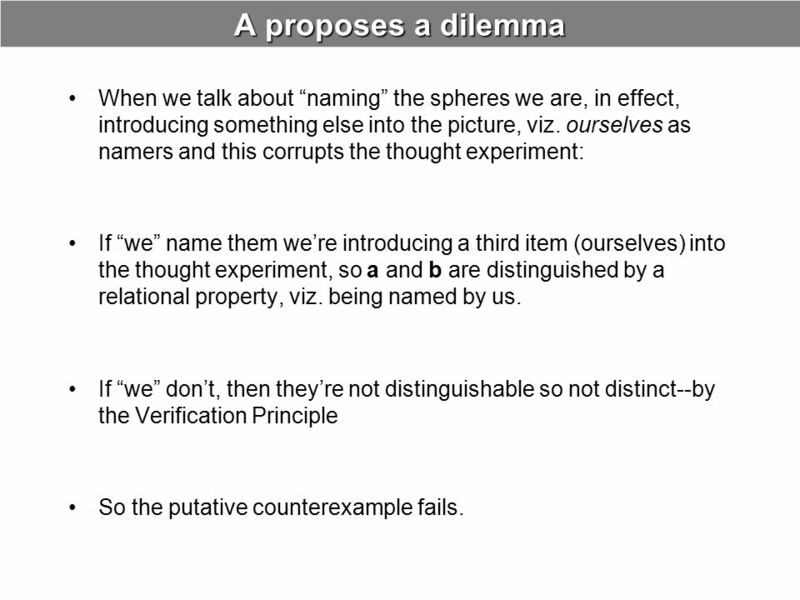 If “we” don’t, then they’re not distinguishable so not distinct-- by the Verification Principle So the putative counterexample fails. 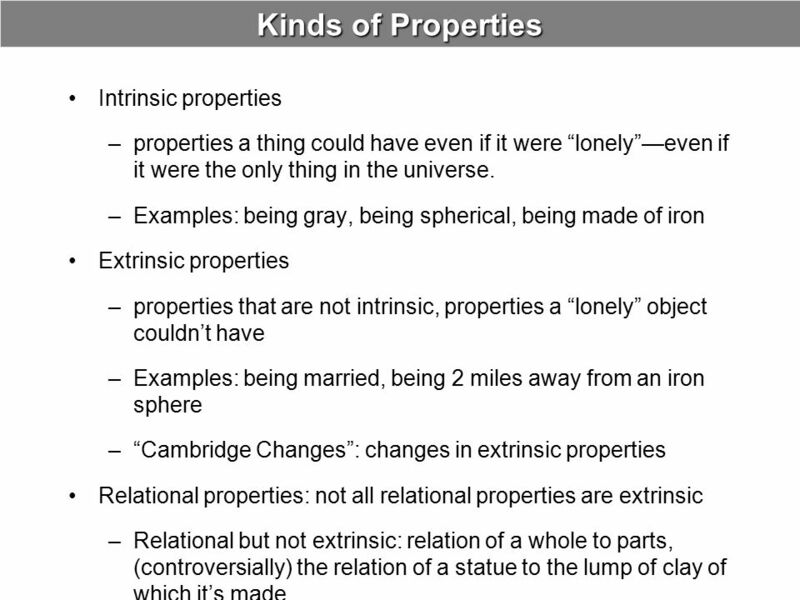 Compare to Berkeley’s argument that unthought-about objects can’t exist. 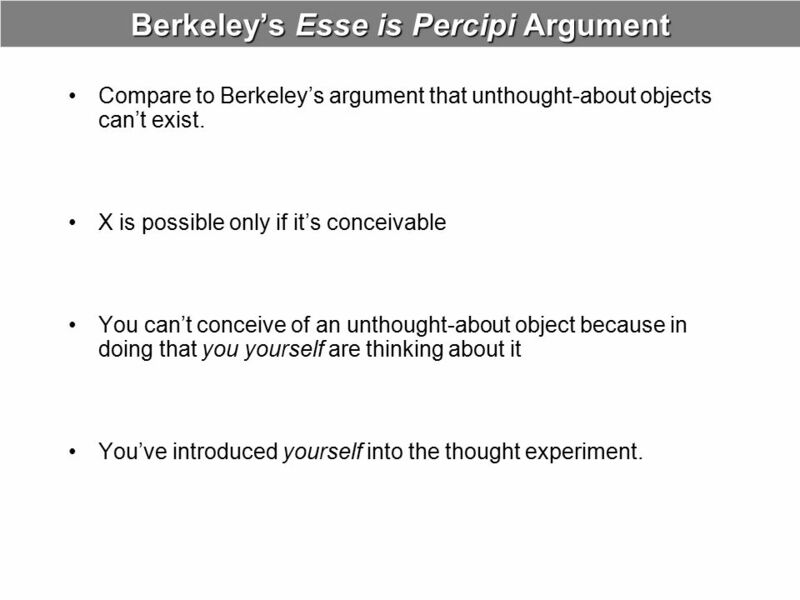 X is possible only if it’s conceivable You can’t conceive of an unthought-about object because in doing that you yourself are thinking about it You’ve introduced yourself into the thought experiment. 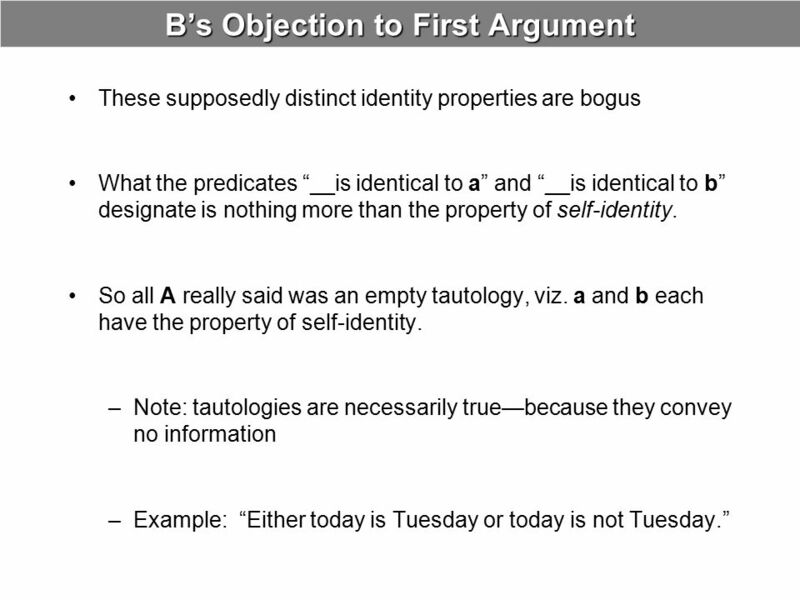 Response to A’s Dilemma: 1st Horn: If “we” name them we’re introducing a third item (ourselves) into the thought experiment, so a and b are distinguished by a relational property, viz. being named by us. 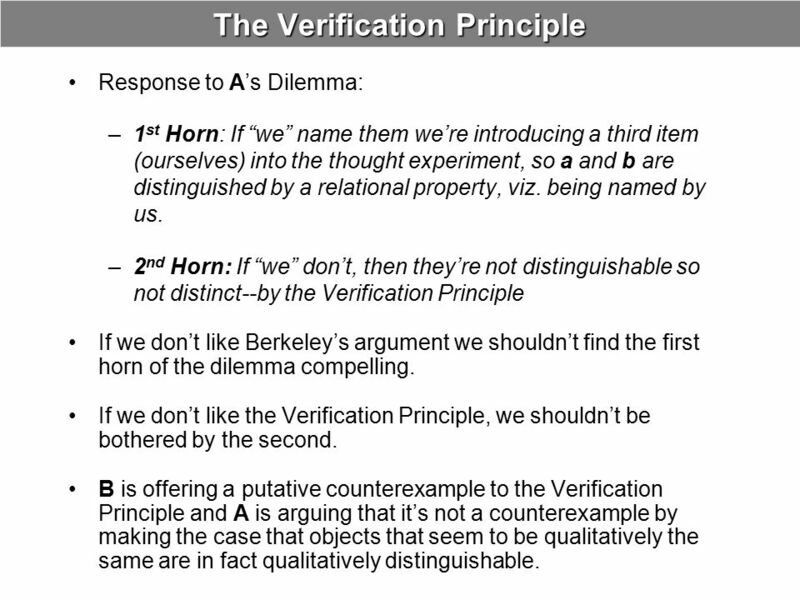 2nd Horn: If “we” don’t, then they’re not distinguishable so not distinct--by the Verification Principle If we don’t like Berkeley’s argument we shouldn’t find the first horn of the dilemma compelling. 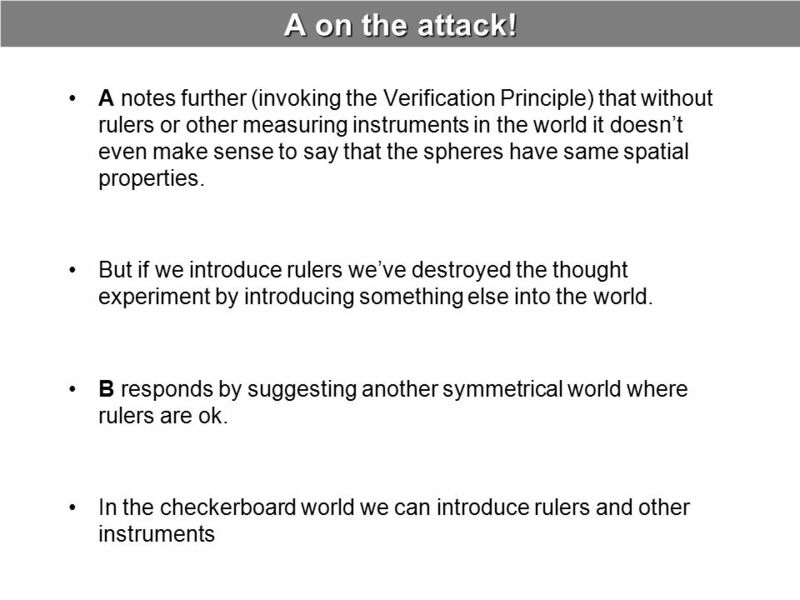 If we don’t like the Verification Principle, we shouldn’t be bothered by the second. 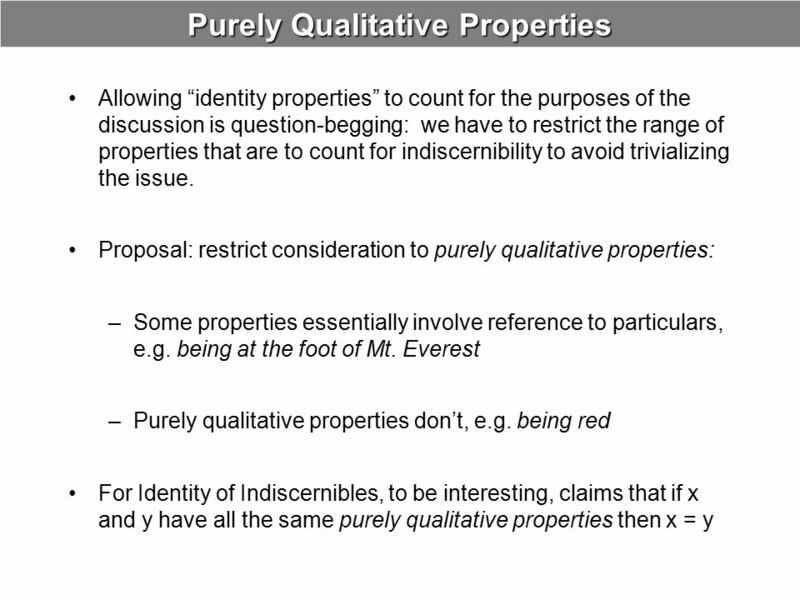 B is offering a putative counterexample to the Verification Principle and A is arguing that it’s not a counterexample by making the case that objects that seem to be qualitatively the same are in fact qualitatively distinguishable. 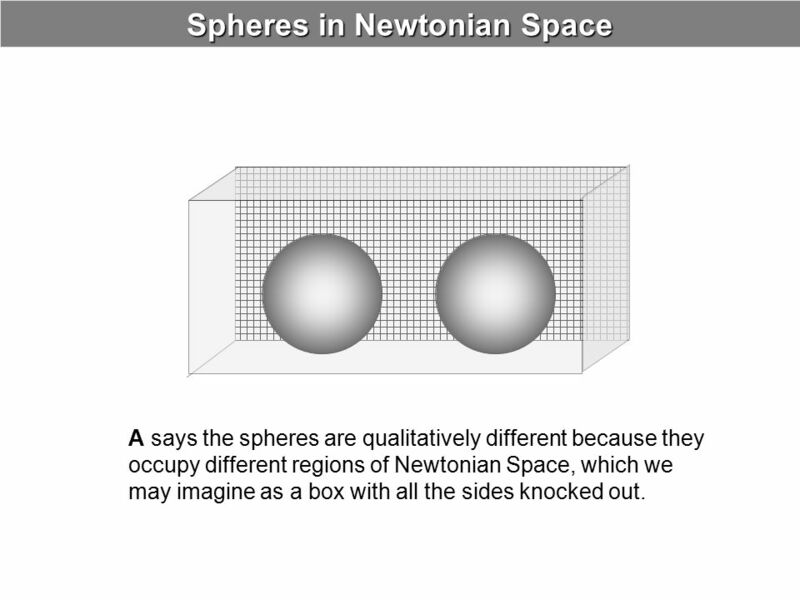 A says the spheres are qualitatively different because they occupy different regions of Newtonian Space, which we may imagine as a box with all the sides knocked out. 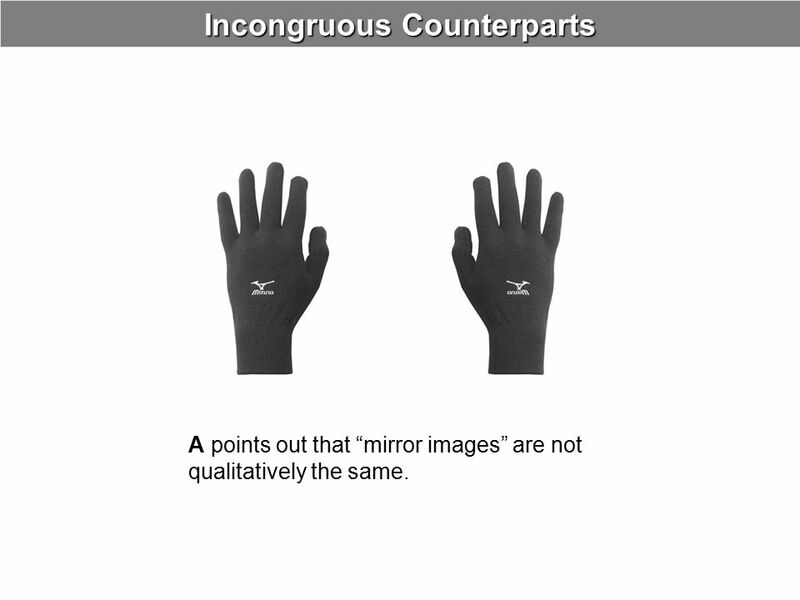 A points out that “mirror images” are not qualitatively the same. 28 An Impasse! 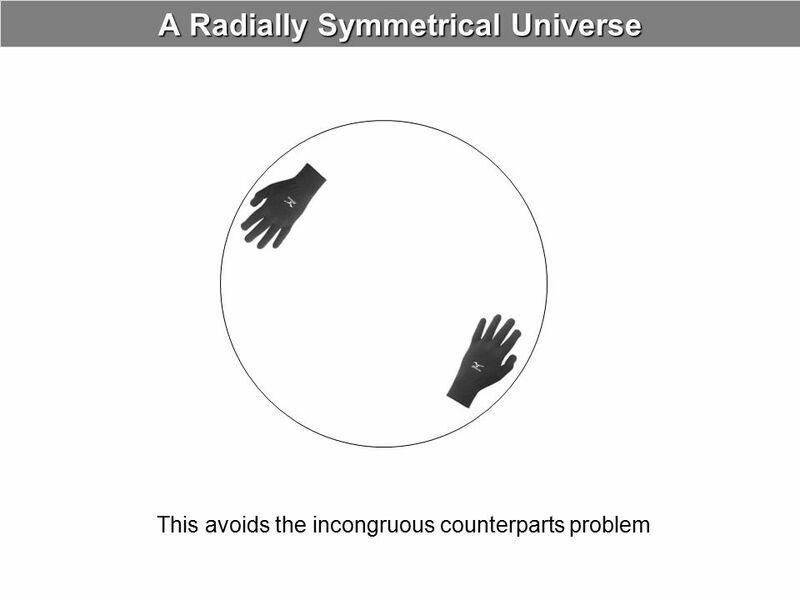 The radially symmetrical universe is empirically indistinguishable from a world where “there’s just one of everything.” But A, committed to verificationism, will say that this just means that there’s no difference between these worlds! And that we haven’t really conceived of what we thought we conceived of. 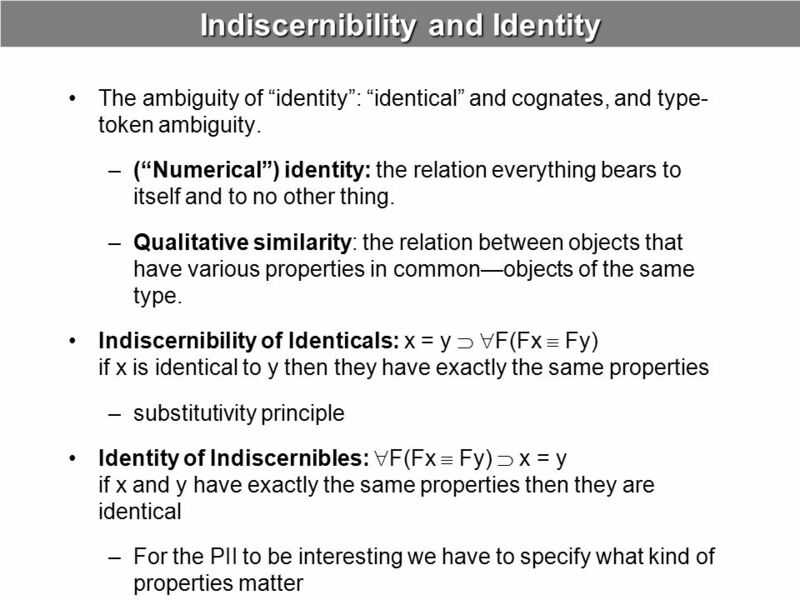 Download ppt "The Identity of Indiscernibles"
65,536 Definitions of Physicalism David J. Chalmers. 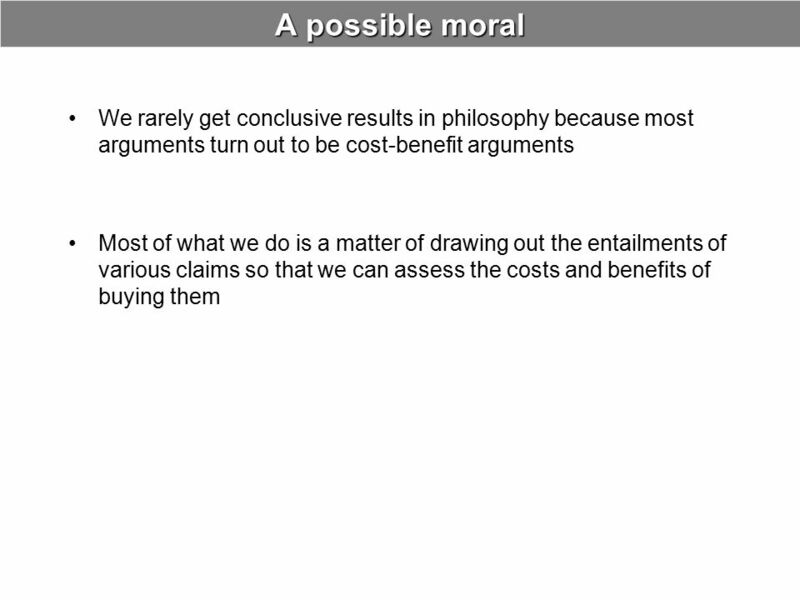 Module 3: Threats to the Possibility of Ethics Philosophy 240: Introductory Ethics Online CCBC Author: Daniel G. Jenkins, MA. 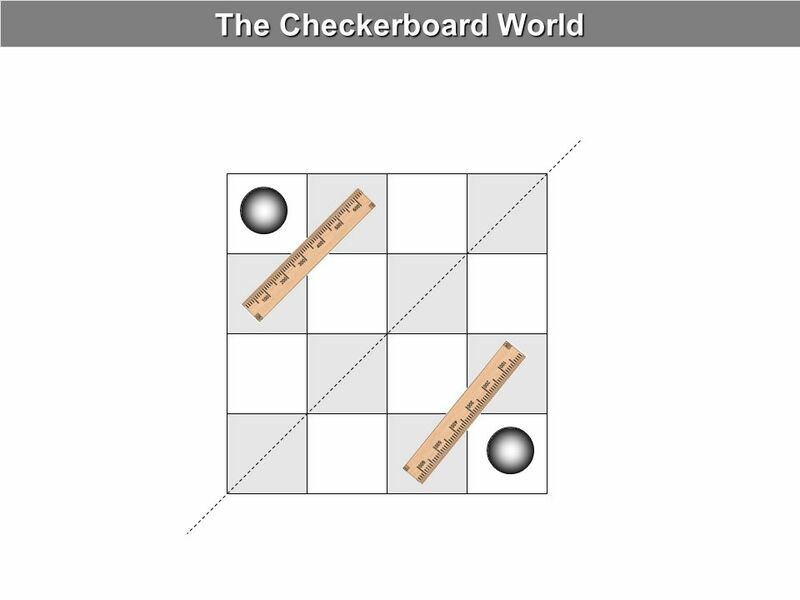 Aristotle “Liveliness is got by using the proportional type of metaphor and by making our hearers see things. 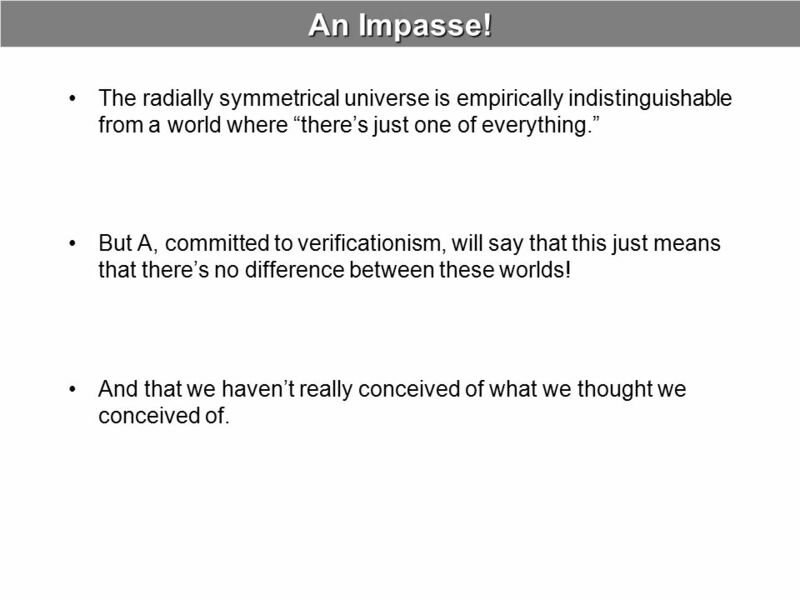 We have still to explain what we mean by. 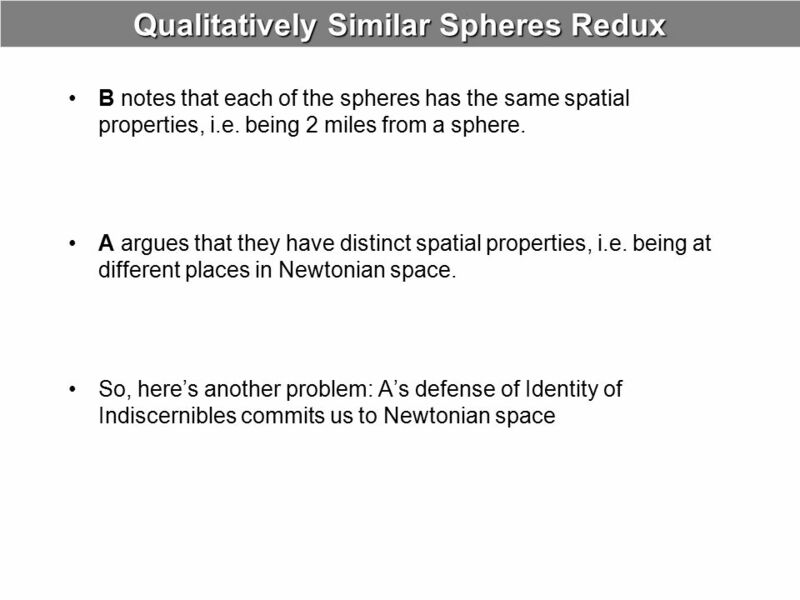 Problems for the Idea Theory. REVIEW FROM LAST TIME. 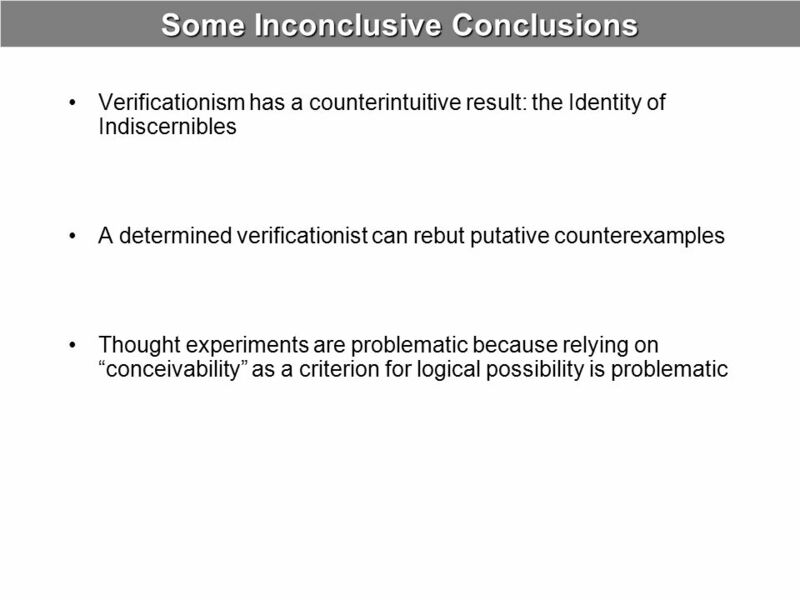 From Anti-Scepticism to the Contingent A Priori Brian Weatherson Cornell University. 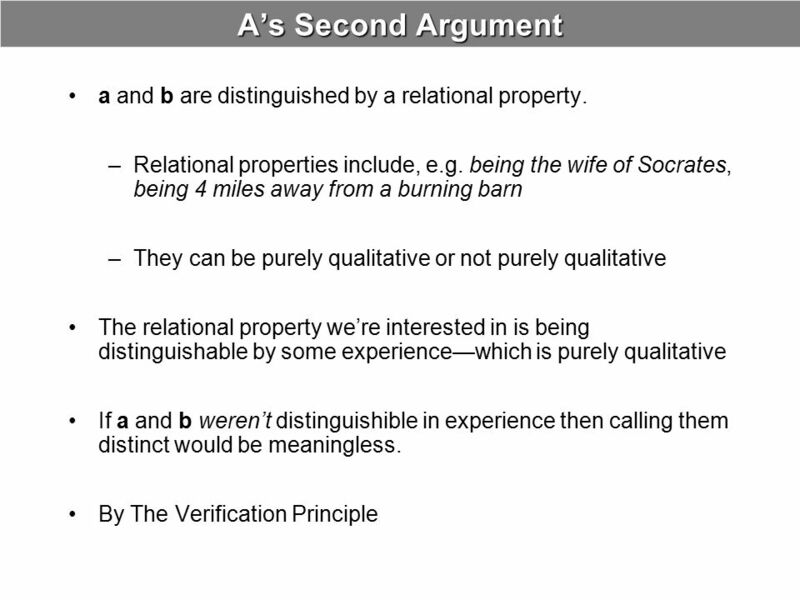 Value conflicts and assumptions - 1 While an author usually offers explicit reasons why he comes to a certain conclusion, he also makes (implicit) assumptions. 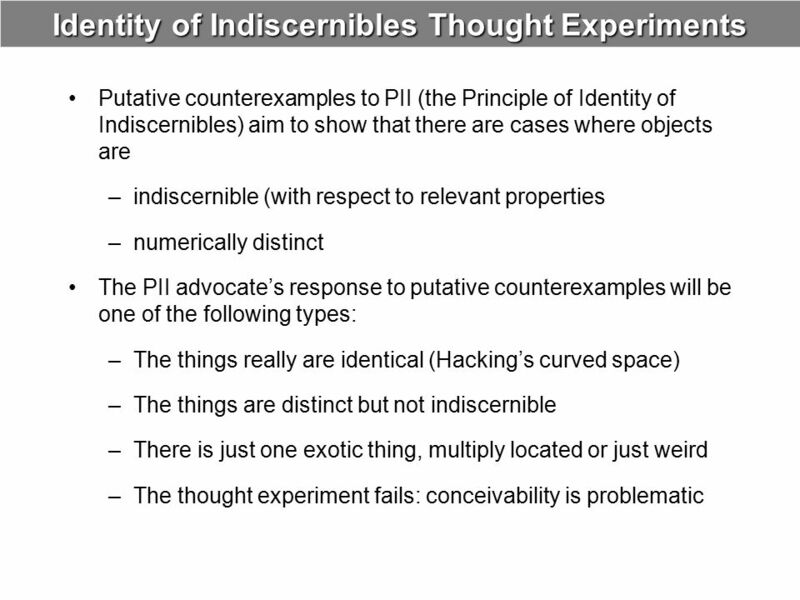 LECTURE 6 NECESSITY & G. E. MOORE ON THE ERROR OF THE ABSOLUTE IDEALISTS.